Crews work on some overturned crude oil cars in the CSX yard in Cheektowaga on Dec. 10. The accident did not cause a spill. WASHINGTON – A hundred tanker cars long, one or two crude oil trains from out west roll through Buffalo every day, along with a train carrying 81 tanker cars of ethanol. And it all sounds pretty risky to Sen. Charles E. Schumer, D-N.Y., who proposed Wednesday that in densely populated New York, the rail industry speed up the phase-out of the most dangerous kind of crude oil rail tanker cars: the type involved in a deadly derailment in Quebec last year and a much less disastrous one in Cheektowaga last December. Schumer’s suggestion won the support of Cheektowaga Town Supervisor Mary Holtz, who said people in the town were shaken up by the Dec. 10 derailment even though it caused no spills or injuries. “We have a lot of houses that are very close to the railroad tracks, so if anything happens here, we’re going to blow up,” Holtz said. That’s exactly what happened in the town of Lac-Megantic, Quebec, last July 6, when a train carrying crude oil derailed. Several tanker cars exploded, 47 people died, and half of the town’s downtown area was destroyed. There are parallels between the tanker cars that blew up in Quebec and those that roll through Buffalo on a daily basis. They all carry oil from North Dakota’s Bakken Shale – the biggest American oil play in decades – to points east. And rail industry sources said most of the oil tanker cars that roll through Buffalo are the DOT-111 model, which is the very same model used on the train that derailed in Quebec. DOT-111 tanker cars aren’t armored or pressurized, making them much more likely to puncture or explode than newer, more sophisticated models. And while the Federal Railroad Administration and the Pipeline and Hazardous Materials Safety Administration are drawing up new rules that will either eliminate the use of DOT-111s or require that they be retrofitted to meet new safety standards, Schumer said that private oil car leasing companies should draw up a plan by July 1 to phase out their use in New York. “Transporting crude oil by rail in outdated tank cars – which have been proven to fail frequently upon derailment – is a ticking time bomb,” Schumer said. Schumer’s statement follows a voluntary agreement struck last week by the U.S. Department of Transportation and the Association of American Railroads that aims to make the rail transport of crude oil safer. Part of that voluntary agreement calls for lowering the speed limit for oil trains passing through Buffalo and New York City from 50 mph to 40 mph. But Schumer said that speed limit should be enacted for trains passing through all heavily populated upstate areas. In statements, CSX Corp. – which operates the trains that pass through Buffalo – and the Association of American Railroads stressed that they are taking steps to ensure that oil is being transported safely. Meanwhile, the Association of American Railroads said the industry was trying to assess how lower speed limits would affect railroad delivery times. “In recognition of the significant growth in crude oil moving by rail, and community concerns such as those raised by Sen. Schumer, freight railroads were willing to quickly come together and identify the voluntary steps announced last week,” the rail industry group said. The voluntary safety measures also include increased track inspections, better braking technology and safer routing for crude oil trains. Those measures follow an astounding increase in the amount of crude oil shipped via rail since the beginning of the North Dakota oil boom. Schumer noted that trains carried nearly 1,400 carloads of oil daily last year, compared with only 31 in 2009. And while CSX would not confirm the number of oil cars rolling through Buffalo, a source with the Brotherhood of Locomotive and Engineers Trainmen said one or two 100-car crude oil trains pass through the city daily, along with that train carrying ethanol. The trains pass over the Fort-Erie/Buffalo rail bridge and then proceed eastward over tracks that parallel Broadway into Cheektowaga before moving on through Rochester, Syracuse, Utica and Albany. There, they turn southward through New Jersey. 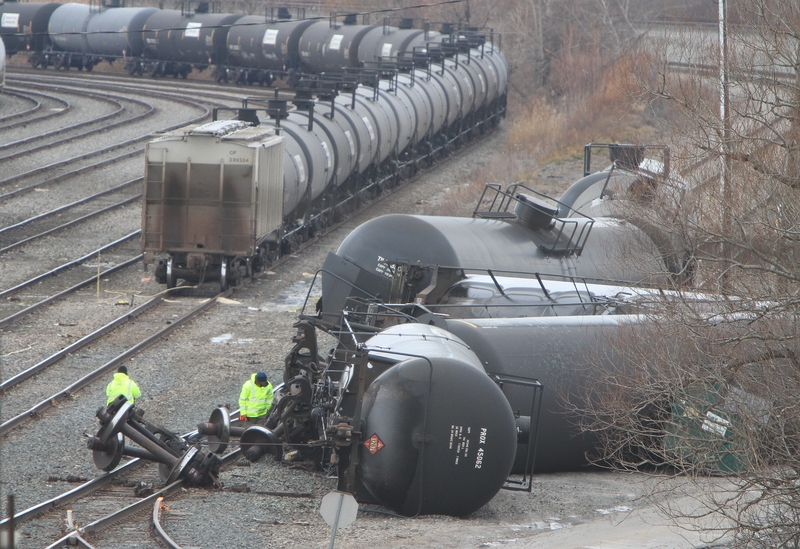 In addition to the spill-free Cheektowaga derailment last December, federal statistics show three small spills of about a gallon each from trains passing through Buffalo last year. In addition, a minor ethanol leak occurred from a train passing through the area last July, said Kate Hudson, watershed program director at Riverkeeper Inc., a New York environmental group that has called for an immediate moratorium on rail shipments of crude oil in the state.